The rise to prominence of Cincinnati, Ohio indie rockers The National over the last few years in this country (and around the world) has been as gradual and organic as their music is grandiose and captivating. The band of brothers – The National features two sets of siblings; Aaron Dessner (guitar/keys) and his twin Bryce (guitar), plus Scott Devendorf (bass) and his brother Bryan (drums), abetted by the glorious baritone of vocalist Matt Berninger – first captivated Australian audiences in the early weeks of 2008, and have since become one of Australia's most sought after touring acts; they wowed audiences at the 2010 installment of the Falls Festival (plus some sold out capital city sideshows), as well as appearing as one of the main draw cards on the inaugural line-up of the Harvest Festival, where they went on to dominate proceedings amidst a slew of high profile bands from both here and abroad. Sometime last year, The National locked themselves away for one of their typically intense creative sessions and emerged with their sixth album, Trouble Will Find Me, and the meteoric rise of this incredible band continued unabated. A different beast to its predecessors, Trouble Will Find Me - which debuted at number 2 on the local ARIA album chart - is a far more relaxed and less angsty collection of songs, still containing the fascinating arrangements and time signatures which characterised The National’s best work in the past but all flowing in a far more cohesive and somewhat breezy manner, augmented by Berninger’s as always soul-searching and self-flagellating lyrics. 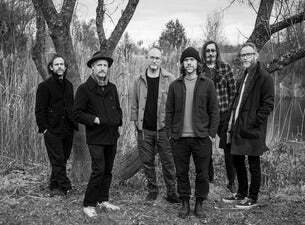 Fans and newcomers alike have willingly grasped this new aesthetic from The National, which is why – in combination with their tireless work ethic of years gone by – their live show is now even more sought after than ever before. After returning to Australia in 2013 for a special one off performance at Splendour In The Grass, The National are returning in their favoured southern summer of 2014 and playing bigger venues than ever before, as more and more people have fallen in love with their intense and sophisticated brand of indie rock. Their socially-conscious message will reverberate around arenas and be soaked up by masses of adoring followers when they return to our shores in February, so get in quickly and don’t miss out when one of Australia’s favourite acts returns for a glorious celebration of all things lush and emotional. All hail The National!